Marvin E. Hall, from Hillsdale, Michigan, was the first Brother from Michigan to become Commander-in-Chief of the Order. He was born in Calhoun County, Michigan, September 1, 1853. He was the youngest of the four children of Horace and Lucetta (Faurote) Hall; the mother, a native of New York State and of French ancestry. Horace Hall was born in Essex County, New York in 1819, where he lived until the age of 21, then made his way to Michigan Territory, locating in Tekonsha Township, Calhoun County, where he was married. Here he was engaged in the sawmill business until sometime in the 1850’s. His wife died in 1855. Horace enlisted in Battery D, (Church’s Battery), 1st Michigan Light Artillery at Burlington, Michigan, on August 28, 1862 as a private. He was 43 years old. Horace was discharged for disability on April 25, 1863 at Triune, Tennessee. In 1877, he moved to Hillsdale, Michigan. He died in 1902, and was buried in Oak Grove Cemetery. Marvin’s mother’s death took its toll on the family. When he was 14, he was sent to live with an uncle in DeKalb County, Indiana. After receiving his education in the local school, he went to St. Louis, Michigan, and worked as a farm hand. Within the next few years, he attended Hillsdale College. At the age of twenty-five, he left Michigan and made his way to Boston, Massachusetts, and engaged himself in the wholesale furniture business. After a time, he moved to Springfield, and opened a wholesale establishment for the sale and production of photographer’s supplies, being the first to manufacture dry-plate negatives for commercial use. This business soon flourished, and he opened a branch in Montreal, Canada. A few years later, he moved to and resided in Montreal. In April 1883, he arrived in Hillsdale as the representative of the Edison electric light, heading the state agency. He temporarily engaged himself in the nursery business. In 1884, he sold out his interest in this venture and became a dealer in military and society supplies, specializing in G.A.R. and Sons of Veterans uniforms, flags, equipment, etc. This enterprise closed its doors in 1893. About 1888, he also opened a men’s clothing establishment. In 1902, he took on the Perry brothers as partners. A few years later, he sold his half of the business to the Perry’s. This established clothier was operated until the 1950’s at the same location at 24 N. Howell Street. Mr. Hall’s professional practices and his energy and abilities won him the favorable notice of the community. He was a Republican and cast his first presidential vote for General Grant. He served as Secretary of the Hillsdale County Republican Committee and later as the Chairman. In 1887, was appointed to the staff of Michigan Governor Cyrus Luce, holding a Colonel’s commission, during Luce’s tenure in the Executive Office. He was elected Mayor of Hillsdale in the spring of 1887, and served until 1890. He had a warm interest in public education and had served as School Inspector. Socially, he was Chancellor Commander of Hillsdale Lodge No. 45, Knights of Pythias, and was a Knight Templar in the Masonic fraternity. He also belonged to the Sons of Veterans, U.S.A., and was a member of George Lumbard Camp #5 in Hillsdale. He served two terms, from 1886 to 1888, as Colonel, commanding the Michigan Division, and Inspector General of the Order. 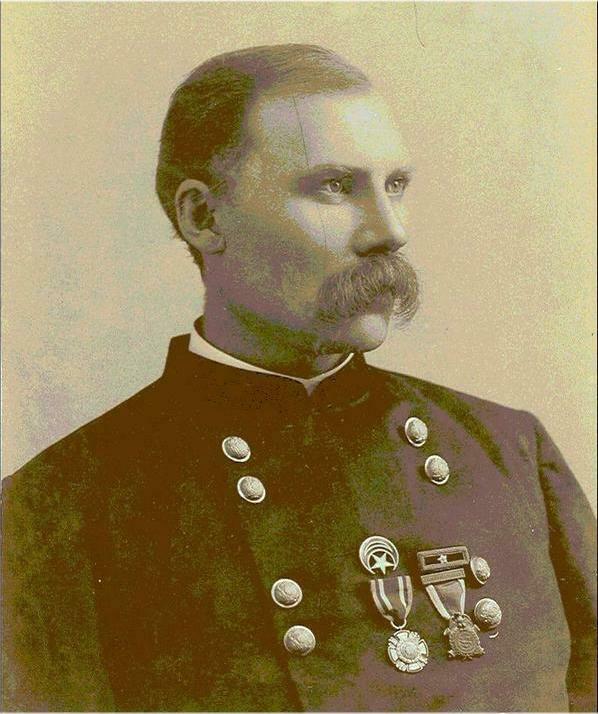 He was elected Commander-in-Chief at the National Encampment held in Helena, Montana August 8 – 12, 1892. A few years following his term as Commander-in-Chief, his name disappears from the roster of Past Commanders-in-Chief, and membership entirely. His name does re-appear on the charter for State Camp #1 of Detroit, in 1910. It is not known why he had left the Sons of Veterans. No mention of it appears in the Proceedings of the Commandery-in-Chief. The marriage of Marvin Hall and Miss Lena Haas was celebrated at the home of the bride in Rome, New York in 1880. They began the journey of life together in a modest home in Cambridge, Massachusetts. Mrs. Hall was born in New York City in 1853. In Hillsdale, the Hall’s resided in a large frame house at 75 S. Howell Street. Lena died on February 6, 1903, of diabetes. She was 49 years old. Marvin left Hillsdale in 1906, moving to Detroit, where he became a bond salesman. On September 25, 1928, at the age of 75, Marvin Hall died suddenly, while in the law offices of Barthel and Flanders. The cause of death was noted as Acute Indigestion. The Hillsdale Daily News reported that he was brought back to Hillsdale on Friday, September 28, on the 11:30am train from Detroit. The body was taken to the Dutcher funeral parlor, and graveside services were held at one o’clock at Oak Grove Cemetery. Funeral arrangements and services were under the direction of the Knights of Pythius. He was laid to rest beside his wife Lena. A small granite headstone over his grave simply states Marvin E. Hall 1853 – 1928. The graves are located two sections due west of the Grand Army of the Republic Monument. The Hall’s had no children of their own, but adopted a daughter, Marie, who survived them. The Commandery-in-Chief is a great legislative body. It has always found, and always will find, plenty upon which to legislate. Compendium of History and Biography of Hillsdale County, Michigan Illustrated. Elon G. Reynolds, Editor. A.W. Bowen & Co. Chicago 1903. Portrait and Biographical Album of Hillsdale County, Michigan, 1888. 150 Years in the Hills & Dales, Vol. II , Hillsdale, Michigan 1978. Kalamazoo Valley Family Newsletter, Kalamazoo Valley Genealogical Society, December,1974. City Directories of Hillsdale, Michigan 1901, 1908, 1923. The Hillsdale Standard, August 16, 1892, page 5. The Hillsdale Daily News, September 26, 1928, page 2. The Hillsdale Daily News, September 29, 1928, page 2. The building in which Hall’s business was located still stands, and is now (July, 2003) the location of The Hunt Club restaurant and pub. While visiting Hillsdale to research this article, Jim Lyons and I asked one of the research librarians at the Mitchell Research Center to recommend a place for lunch. She recommended the Hunt Club. It was not until after lunch and looking through the last of the material for information that we discovered that it was, in fact, Brother Hall’s building. Coincidence? Fate? Something else? The house at 75 S. Howell still stands and is currently undergoing restoration. Special thanks to James T. Lyons, PDC, for his assistance in the research for this biography.